The Federal Reserve releases minutes from their latest Federal Open Market Committee (FOMC) meeting Wednesday, and retail sales figures are due Friday. 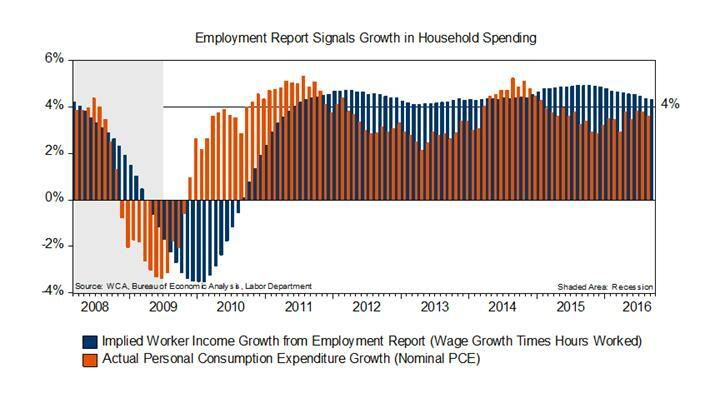 Friday’s employment report suggests that income and spending are still growing. Six and one quarter years from the recession’s end, we see that the average wages and total numbers of hours worked are expanding. We estimate that hours will be expanding at a 1.5% yearly rate and wages will be growing at 2.5%. Combining these figures, total income should be expanding near 4%, and this pace is consistent with an expansion in consumer spending also in the ballpark of 4% (chart below). And since there is a close correlation between consumer spending and GDP growth, we may also intuit that the economy is still on a growth path. While growth in hours worked is slowing toward 1.5% versus 2.5% last year, wage growth is picking up. By our estimate, hourly earnings are growing near 2.5% versus 2% a year ago. This raises the question whether the uptick in wage pressure signals the start of aggressive rate hikes by the Federal Reserve (Fed). We don’t think so. Here’s why. Core inflation remains below the Fed’s 2% target, and the connection between wages and inflation is a dubious one. Fed Chair Janet Yellen has expressed her own doubts that an initial wage increase must necessarily lead to inflation. She argued that after an initial pickup in wage growth, higher real wages should attract more workers back into the labor force, should put a lid on wage growth, and stabilize the falling unemployment rate. Friday’s employment report supports her basic argument. The labor force participation rate, the percentage of working age people either having or looking for jobs, is up 0.5% from a year ago. This is the strongest annual advance in the labor force participation rate since 1996. If Chair Yellen is right, unemployment should stay near 5%, wage acceleration should stall, inflation should remain low, and policy rates can continue to rise gradually. LONG-RUN STRATEGIC POSTURE: Our long-run forecasts lead us to overweight large cap domestic growth stocks, high-yield corporate bonds, and gold in the diversified “core” of portfolios. Underweight positions in “core” are long-term U.S. Treasuries, foreign developed equities, and REITs. The equity allocation in the short-term tactical”satellite” portion of portfolios currently stands at 60% equity/40% fixed income.